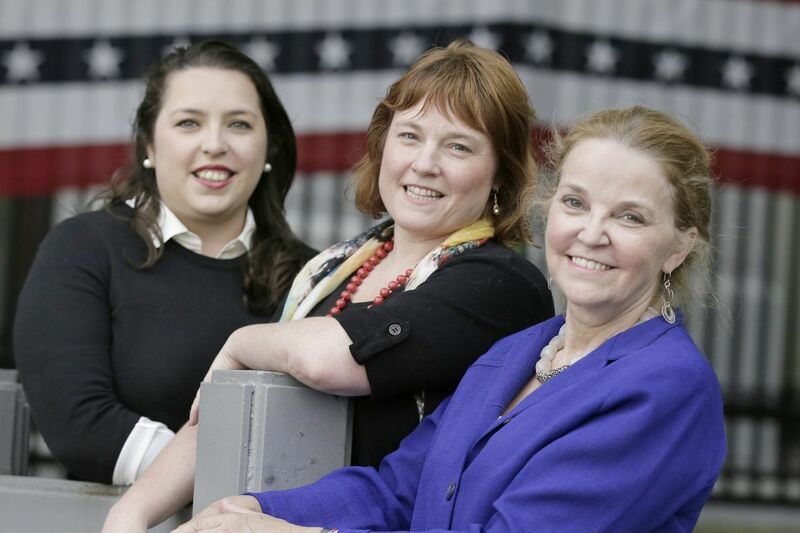 Former corporate executive Christine Jacobs, right, is among the founding members of Represent PAC including (left to right) Aubrey Montgomery and Kerri Kennedy. Her group expects to raise more than $100,000 to help women win seats in Pennsylvania’s male-dominated state House and Senate. I'll admit it, part of me wished I'd been at Citizens Bank Park on Thursday to hear the roar of Phillies fans booing their data-head manager, Gabe Kapler, at the home opener. But I was having too much fun talking on the phone with a different kind of data guru. A woman with a political-numbers game that is hands-down hot. Jennie Sweet-Cushman is her name. She was on a train rifling through computer files for me while Fancy Manager Gabe was being given a Philly-fan kiss of scorn. Gabe the data head who rotates through pitchers like a kid with a roll of Bounty; Jennie who does all things data regarding women in politics in Pennsylvania. Jennie's version of data wow was much more impressive. Jennie has pie charts. Lots of them. They show a major-league shift in the state's political scene. She made the pie charts from the avalanche of names of people running for state and federal legislative races in this spring's primary. 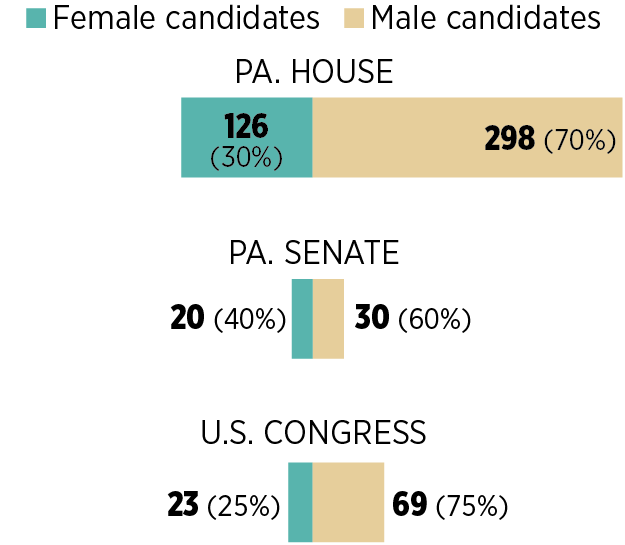 A quarter of Pennsylvania's 69 congressional primary candidates are women. But that's not the big headline. It's what's happening in the unsexy but important state races that's wild. After years of being so marginalized that they hardly exist in the Capitol, women are attempting, in exceptionally large numbers, to storm the Harrisburg political clubhouse long dominated by men. Just how many are vying for 203 state House and 25 state Senate seats up this year? Jennie's your man on that one. "I've got that," the assistant director of the Pennsylvania Center for Women and Politics told me while juggling both her computer and a cellphone. "It's more than it's ever been before." Candidates by gender for the 2018 primaries. "In the House," she began, "126 of those candidates are women and 298 are men." That comes out to 30 percent of all candidates being women — a head-turner considering that only 18 percent of House members are women. "It's really in the Senate," she continued, "where you're going to be wowed." These are not small-ball numbers. This state, remember, has a sorry officeholder profile when it comes to gender. Fewer than one in five lawmakers in the state House are women. (No one in our 18-seat Congressional delegation is a woman, either.) It's as though Lex Luthor dropped a supernatural force field onto the state to keep women as far away from political power as possible. The driving force behind this year's surge: Democratic women. They outnumber Republican women tangling in the primaries, though more Republican women than Democrats are currently in office. But that's not the most remarkable aspect of this. It's the fact that women this year are taking action, en masse, beyond voting. They are pounding pavement to fill the actual seats of power that have for very long belonged to men. In so doing, they are the political equivalent of a AA baseball team loaded with prospects. If they win, they bounce into the majors. If they lose, they stay in the mix, training and waiting for the next chance to pounce. "There will be more women serving the Commonwealth in November." Of that, Jennie is sure. "How many? I don't know. But at this point, when you're talking about 18 percent in the General Assembly, wouldn't [even] 23 percent be great?" Considering that Pennsylvania has never had a female governor or U.S. senator and only ever had a few women serve in Congress, to think that an infantry may be forming for the future is amazing. "This," in Jennie's words, "is a farm team." The energy surrounding these races is translating into money, too. Represent PA, the only political action committee working exclusively to elect women (Democrats, in their case) to the Assembly, has raised more money a month before the primary than it raised during the entire election cycle two years ago. The PAC's tally is at $50,000 and is expected to exceed $100,000 by November, said Christine Jacobs, a Philadelphia-based former pharmaceutical and utility industry executive who helped form and is executive director of the PAC. The group a few days ago announced it received applications from roughly 70 women candidates running for House and Senate seats and had chosen 32 to endorse and finance. The group has been walking away with donations after holding meetings with just about any crowd of progressive women who invite them to gatherings — residential facilities, universities, and the like. "I tell everybody, 'Invite me to meet your friends,' " Jacobs says only half-joking. What's also amazing is how voters who would have pooh-poohed these normally ignored or misunderstood state races are instead getting fired up and throwing money at them so women can win, she said. "We're just finding a lot more women who are nontraditional givers," Jacobs said. With women leading the charge, Democrats are hoping to grab the House from Republicans this year. The odds are long for taking the GOP-run Senate. But even if many women lose, they win. "We'll have over 100 women with campaign experience," Jennie says. Women who will wonder where to next aim their fastball: Borough council? Mayor? "That's where I'm most encouraged," she said.